Periodontitis, or otherwise known as gum disease, is a serious gum infection that damages the gums and destroys the bone that supports your teeth. Periodontitis can cause tooth loss or worse, an increased risk of heart attack or stroke and other serious health problems. Periodontitis is common but largely preventable and is usually the result of poor oral hygiene. You may notice a yellow or black buildup near the gum line or bleeding gums when brushing. Bad breath and a chronic bad taste in the mouth are also indications of gum disease. Brushing at least twice a day, flossing daily and getting regular dental checkups can greatly reduce your chance of developing periodontitis. Once the disease has been treated, typically by a deep cleaning, it can be stabilized. 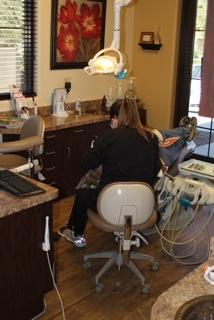 Please contact Power Ranch Dental and ask us how we can help you with all of your perio needs (480) 988-2282.